If I asked you “What makes your husband feel loved?” would you be able to tell me? As I interviewed hundreds of wives for my newly-released book, When a Woman Inspires Her Husband, I discovered most wives are more focused on what their husband’s aren’t doing to meet their expectations than on what they can do to make him feel loved. I, too, was once in that camp. I continued to let my husband know how he was failing to meet all my needs and expectations. Poor guy. I never thought to ask him how I could meet his. As I began to focus on loving my husband as God loves me, transformation began in my marriage. God began to turn my husband’s heart around toward me. In other words, the less I complained about what he wasn’t doing and the more I focused on loving him for the sake of loving him (and not to get something out of it), the more he began showing love to me, as well. Or maybe I just began to notice it for the first time. Regardless of whether he changed or my perspective changed, the fact is that my marriage changed – for the better. And it can happen in your marriage, too. *I feel loved when she accepts me without feeling the need to fundamentally change who I am. *I know she loves me when she upholds my character and personality to others and doesn’t feel the need to apologize for who I am or explain it to others. *I see her love in the way she’s always willing to start over. *She can show me she loves me by still being nice to me even when I’m a jerk. *She doesn’t compare me to others; she doesn’t try to change me. *By telling me I am a great husband and father and that she is fully satisfied with who I am today and not who she hopes I can be molded into tomorrow. *When she tells me and others that she is honored with who her husband is, I know that she loves me for who I am. *When I come home, my wife might do something that irritates me and rather than giving her grace, I’ll snap at her. But despite things I’ve done, which have been very unattractive, she still extends grace to me. *She loves me in spite of myself, just like God does. Did you hear it? The sound of humility from husbands who realize they’re not so easy to love? The gratitude that they’re even loved in the first place? The conviction of their own behavior which happens when they see their wives being selfless? Your husband does notice when you love and accept him, even when he’s not being so lovable. In fact, he notices itespecially when he’s not being so lovable. Your husband may be tough, but he is also tender on the inside. And if you dig deep enough, you will find in him a heart like yours – longing to be loved and appreciated for who he is, and wanting to be forgiven for the times he blows it. As I prayed about loving my husband as God loves me, one of the things God showed me is how very easy it is for me to put myself first. It’s shameful when I think of my Lord’s example of washing His disciples’ feet and dying for the sins of mankind. I’m sure my selfishness is displayed in my marriage more than I realize. My husband sees it. But that is not sacrificial love. “Greater love has no one than this that he lay down his life for his friends. You are my friends if you do what I command” (verse 13). We are to love our husbands the way Jesus Christ loved us when He laid down his life for us. Throughout the Bible, God is seen as a protective and loving God. He comes through for His people. He protects His own. 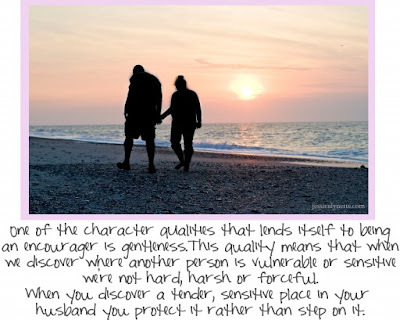 Do you have a protective love going on for your husband? My husband is a pastor and there are times when I hear something hurtful that someone said about him. The inner tigress in me wants to claw out that person’s eyes and rip out their tongue so they never say something hurtful like that about him again. Do you ever feel that urge when your husband is being attacked? Chances are your husband is in some kind of arena where he can be “beat up” too -- by co-workers, a boss, some who may be competing for his job, and so on. There may be days when your husband is quite possibly disrespected at his office, at his workplace, by his grown children, by someone in his extended family. Whether he’s a coach, an executive, a supervisor, a teacher, or an employee working under someone else, he has his days, be sure, when he is the target of accusation, the brunt of jokes, the disappointment of others, the one who let the team down. Those are the days he needs your understanding smile and the reassurance that no matter what anyone else thinks of him, the most important woman in his world still believes he’s her hero. That’s the kind of protective, reassuring love he needs to get back out there and face it all again the next day. Scripture speaks of God’s loving kindness that lasts forever. It also speaks of His unfailing love. I believe the most thorough description of love that we can find in Scripture is First Corinthians 13:4-7. Quoted at many weddings, this passage describes enduring love – love that just won’t quit. In case you’ve read through this portion of Scripture many times, I want you to get a fresh look at it by reading it in a more contemporary translation so it hits you in places that perhaps it hadn’t before. And ask yourself: Does this describe my love for my husband? But keeps going to the end (The Message).